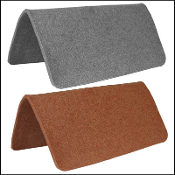 Wool pad protector 1/2" thick in grey or tan. Wool is one of nature’s most durable fibers and conforms easily for a perfect fit. Keep your horse dry and cool with wool against the skin. Size: 30" x 30"